Aside from folk and regional dances (southern Thailand's Indian-influenced manohra dance, for example), the two major forms of Thai classical dance drama are khon and lakon nai. In the beginning both were exclusively court entertainments and it was not until much later that a popular style of dance theater, likay, evolved as a diversion for the common folk who had no access to royal performances. 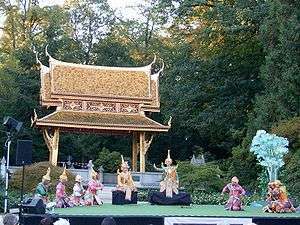 Khon performance in 2007 in Germany. Thai classical dance drama include Khon, Lakhon, and Fawn Thai. 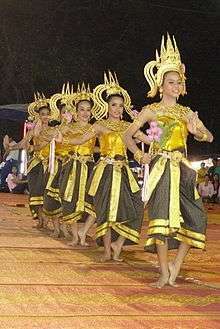 Khon is the most stylized form of Thai dance. It is performed by troupes of non-speaking dancers, the story being told by a chorus at the side of the stage. Choreography follows traditional models rather than attempting to innovate. Most khon performances feature episodes from the Ramakien. Costumes are dictated by tradition, with angels, both good and bad, wearing coloured masks. Lakhon features a wider range of stories than khon, including folk tales and Jataka stories. Dancers are usually female and perform as a group rather than representing individual characters. Fawn is another form of "folk-dance" accompanied by folk music of the region. The first Fawn originated from the northern region of Thailand, it was designed and taught by Chao Dararasami of Chiang Mai. 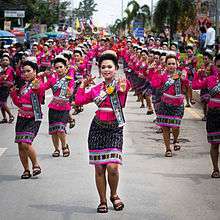 Since then, a variety of "Fawn" came into practice, according to the music and style of each province, such as the Fawn-Lep (ฟ้อนเล็บ) finger-nail dance from Chiang Mai, Fawn-Ngiew from Chiang Rai with the influence of Burmese music and costume. Fawn leb is a Northen Thai dance style, each dancer wear 6 inch long brass fingernail. The long fingernail essentialed the finger movement of each dancer. DAncer wore chignon style with yellow flower like tiara with long chain jasmine flower. Fawn Tian is consist of eight dancers carrying candles in their hand. The choreograph position is usuaaly divide into pair of two, one each side. The wore full-length sarong and jackets with a matching shoulder cloth. This dance is always held at night. Fawn Ngiew is a dance in which is shown or perform in a happy event. The dance is kind of like Fawn Leb but the dance is more faster and abit more fun. Each dancer wore a yello flower tiara, Jong Kra Bane, and Sabai. Folk dance forms include dance theatre forms like Likay, numerous regional dances ("ram"), the ritual dance Ram Muay, and homage to the teacher, Wai Khru. Both Ram Muay and Wai Khru take place before all traditional Muay Thai matches. The Wai is also an annual ceremony performed by Thai classical dance groups to honor their artistic ancestors. Ramwong (รำวง) is a type of partner dance in a circle. Ram Muay (รำมวย) is the ritualized dance that takes place before Southeast Asian kickboxing matches such as muay Thai. Wai Khru (ไหว้ครู) Wai khru ram muay is a ritualized form of dance meant to pay respect to, or homage to the khru or teacher. It is performed annually by Thai classical dance institutions as well as before muay Thai matches. Sri-Nuan is a typical dance of central Thailand. Its great popularity is due to the choreography and the sweetness of the music that accompanies it. The lyrics and music evoke the sweet nature of Thai girls. The dance is also an expression of the yearning of a young man won by such great charm. Teut-teung (drum dance) The teut-teung drum, an instrument used in Thai folk music, is played throughout the country to accompany the parades held at traditional festivals. It is said that the modern style of the teut-teung dance was created by some music teachers. Farmers Dance (rice growers dance) This is a modern dance created by the Thai Ministry of Culture. The dancers wear the rice growers traditional costume and the dance itself enacts the daily activities of these workers who are the backbone of the nation. The ballet opens with the farmers as they come to plough and sow the fields. When they are sure that the rice is growing well, they gather together to pray to Mae Po Sop, the goddess who protects rice-growing. Lastly, the harvest is celebrated with songs and dancing. Combat with Short and Long Sticks and with Swords These dances are inspired by types of combat that were typical of Thailand, in which either sticks or swords are used. The skillful use of the short stick depends on the agility of the fighter, who must attack and always remain close to his opponent, while the combatant who takes up the long stick must maintain a critical distance from his rival to use his weapon effectively. The art of sword fighting has been practiced in Thailand since the beginning of time, and, traditionally, a ceremonial dance is performed prior to combat. Serng Kratip Khoa This dance is performed during traditional celebrations. Usually the word "serng" is added to the name of the domestic object used on stage by the dancers. In the case of the Serng Kratip, the dancers carry typical rice baskets, known as "kratip". Their movements imitate those of the women who bring food to the men working in the fields. The choreography is accompanied by music with a lively rhythm. The instruments used are a long drum, "charb" (cymbals), "grab" (a kind of castanet), "mong" (gong), and the "kahen" (like an old-fashioned syringe). Serng Isan This folk dance is generally performed at traditional festivals. The choreography is entrusted to the dancers who wear brightly colored costumes, and expresses all the joy of the celebration. Fon Phu Thai This dance is part of a propitiatory ceremony performed by the Phu Thai tribe, who live in the northeast. The music that accompanies it is played on typical instruments like the "gong ching" (a tribal drum), along with other drums and pipes. The gong ching plays a fundamental part because it sets the rhythm for the dance. Serng Krapo (Coconut Dance) "Krapo" is the word for coconut in the northeast dialect. The dance illustrates the activities of a group of nubile girls from the southern part of the region, known as Isan. The dancers hold two coconut shells, with which they execute complex choreographic movements, shaking them, tossing them, or tapping them lightly. This dance is often accompanied by the sound of the pong lang, a kind of upright xylophone, made of strips of wood arranged according to the musical scale. Isan Bantheong (the happiness of Isan) This is a series of folk dances usually performed on festive occasions. The swift, harmonious movements are accompanied by folk songs associated with the northeast region. Fon Sao Mai (Silk Weaving Dance) Fon is a type of dance in northern and northeastern Thailand. It is performed in groups and has very slow, graceful, and almost meditative movements. Fon Sao Mai depicts a traditional profession of northern Thai women in silk weaving. The dance imitates different processes of silk-weaving. For generations, silk production is one of the top home industries in northern and northeastern Thailand and the neighboring country, Laos. Dance of the Nantha-Peri and Pu-Cha Drums The nantha-peri is a drum characteristic of the northern region of Thailand, which is used for two purposes: to spur on warriors prior to battle and to pay homage to the Buddha in religious ceremonies. The pu-che, on the other hand, is a type of drum used by the tribes that live in the north: the Tay Yai, the Tai Lue and the Tay yan. It is used to accompany various dances including the sword dance, and the kai lai and king ka lai dances. Sword Dance This dance is inspired by an ancient martial art that requires tremendous courage and strength, and excellent reflexes. The dancers balance a number of swords on different parts of their bodies while fighting off their rival with a sword sheath. Ka-Lai Dance Beginners learn to execute graceful and balanced movements through the choreography of this dance. King-Ka-La Dance The hand movements and steps of the female dancers, who wear spectacular fan-shaped costumes, evoke the movements of a bird. The Sounds of the Mountains The music that accompanies this dance is played on wind instruments characteristic of three tribes in the North of Thailand: the pi hom (a gourd pipe) of the Tai Lue, the pi joom of the Tay Yuan and the kan nam tao (a gourd flute) of the Li Saw. Candle Dance Typical of the Thai Kheun tribe, this dance is performed in honor of the Buddha. The female dancers pay homage to the divinities that protect the eight cardinal points of the Earth, asking them to pass through the candlelight in homage to the Buddha. Khan Dok Dance The striking choreography of this dance of blessing expresses the calm, serene temperament of the northern peoples. Choeng Tua Auk-son Dance This dance, performed in the Buddha's honor, is characterized by a complex choreography inspired by the calligraphy of the ancient alphabets of the northern regions and by the movements used in martial arts. The Sounds of Lanna, the Ancient Kingdom of the North This music is played on two instruments typical of this region. The phin-phia is a stringed instrument whose body is made from a coconut shell. When he plays it, the musician rests the shell on his bare chest, then moves it or presses it to achieve the desired tonality. In the past, the phin-phia was the instrument used by youths to court the maidens of their village. Few musicians still play it. The sueng is a stringed instrument, made of teak or hard wood. It is played by plucking the two metal or brass strings with a horn plectrum. The Nora The Nora is a traditional dance of Southern Thailand (in South Thai language called the "Chatri"), whose origins lie in various legends of which there are different versions. The choreography of the Nora dance varies from region to region, but is generally composed of 12 positions and 17 movements. Nora Tua Oon This very refined version of the Nora requires great interpretive skills and experience. To learn this Nora it must be studied from a very young age, so that the body can achieve the flexibility necessary to execute the complicated movements. The female dancers, in fact, follow a demanding exercise regime and a strict discipline. Ram taeng Kae This is another elaborate Nora dance that requires great interpretative gifts. On the stage the protagonist launches a harpoon at the crocodile, whose back, lit by candles, is made from the trunk of a banyan tree. The female dancer moves round the writhing crocodile, poised to pierce its head at the right moment. Ram Nora Son Ram This is a basic posture, which is executed by concentrating on hand arm and shoulder movements, and on the equilibrium and movement of various parts of the body, and is accompanied by rather long lyrics. Ram Kien Pral - Yieb Louk Manao - Ram Ko Soet This advanced level of the Nora dance is usually performed during a competition between two groups of dancers. To intimidate the rival group, a male dancer strikes an effigy. In the version known as Yleb Louk Manao, the female protagonist stamps on three lemons symbolizing the hearts of the rivals. The dance is performed as a sign of victory. In the next dance the female protagonist asks the pran, the comical hunter, to give her a headdress as a symbol of her victory. This is a ceremonial ritual carried out to dishonor rivals and to encourage the members of the group, and is characterized by a certain sacredness, as can be seen from the style of the dance. Ram Nora Bot Pratom This choreography uses another basic posture, in which hand, arm and shoulder movements are synchronized with those of the head. Ram Ooak Pran In the company that performs a Nora, the pran or hunter plays the part of the fool. He usually wears a hunter's mask or headdress. His movements are often amusing, and designed to make the audience laugh. Each position is in harmony with the dynamic rhythm of the music. Ram Nora Klong Hong This advanced level of Nora is performed only on important occasions. The female protagonist plays the role of Hong or Kinnaree - a legendary creature who is half woman and half bird. According to a celebrated Nora teacher, this episode is partly based on the legend of Prasuton-Manora. The seven Kinnaree are playing in the lake in the middle of a wood. Struck by their beauty and lightheartedness, Pran Boon, the hunter, chases the maidens in an attempt to catch the youngest. The lively harmonious movements perfectly evoke Pran Boon's pursuit of the Kinnaree as she tries to escape. Ram Nora Tam Bot - Ram Ooak Pran In this dance the hand movements evoke the beautiful scenery of Songkhla Province in South Thailand. The verses of the song are accompanied by a very lively rhythm. Rabam Srivichai - Rabam Sevichai is one of the so-called "Thai archaeological dances". It is a reinvented dance to represent the kingdom of Srivijaya, an 8th to 13th century Buddhist maritime empire that encompassed present day Indonesia, Malaysia and Southern Thailand. The choreography and dance costume are based on images carved as bas-relief on the great stupa of Borobudur in Central Java, and other artifact of the Srivijaya period. The musical melody was also composed in Javanese style. 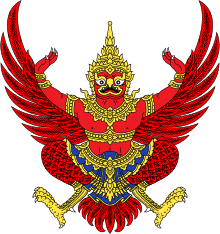 The colors, black, red, and green are characteristic of Southern Thailand. The head-dress is called a Krabang Naa. Some of the dance movements, poses and stances are based upon classical Javanese and Balinese dance tradition. Many folk songs in Thai dance have story about the history of Thai dance. Phleng Cha-Phleng Reo - Phleng Cha–Phleng Reo were found from the Ayutthaya period and recorded and taught continuously up to the present time. It is considered to be the song for basic dramatic art trained dancing. Rabam Chiang Saen – Rabam Chiang Saen is widespread in the northern part of Thailand. It is widespread down to the river basin to Laos. Ram Thawai Phraphon – It is danced for auspicious ceremonies such as Father's Day and Mather's Day. Rabam Thawarawadi – Rabam Thawarawadi dates to the Dvaravati period. Ram Baisri Sukhwan – Ram Baisri Sukhwan is another performance from northeastern Thailand. The dance is performed in the Bai Sri Su Khwan ceremony which is used to welcome foreign officials or important visitors. Manora Buchayan - Manora Buchayan is the demonstration derived from the name of drama named Phra Suthon-Manora in part of Manora sacrificed. There is no song text. The actors and actress dance along with the music. Chuichai Phram- Chuichai phram is dancing of the actors in Phra( man) type. It is taken from the ancient royal work for beginning named was Phraganessiagna in the time of King Rama VI. Chuichai Benyakai - Chuichai Benyakai has been taken from the drama, Khon Nangloy. Chuichai Wanthong - Chuichai Wanthong has been taken from the drama named Khun Chang-Khun Phan's Phra Wai Taek Thab (The Defeat of Phrawai) by the Department of Fine Arts. Rabam Lopburi - Rabam Lopburi is appeared by copying the characteristics of an idol, the picture, the sculpture, the statue, the bronze statue, the stone carve, the rear guard gate the ancient places found in the Lopburi period. Rabam Krida Bhinihan - Rabam Krida Bhinihan has been taken from the drama Thailand glory. Soeng Praewa - Soeng Praewa is show by people in northeast Thailand. It is the local folk dance in general festivals or any special occasion. Krailat Samreong - Rabam Krailat Samreong is the folk dancing demonstration taken from the Natasin collage drama named "Manorah". The Fine Arts Department demonstrated it to the people in 1955. This demonstration set showed the co-blessing from the whole things living in Krilas Mountrain. Ten Kam Ram Keow - Ten Kam Ram Keow is about farmer. This song is show entertain of farmer. ↑ "A Thai Archaeological Dance". The World In Paper View. 28 January 2015. Patravadi theatre presents Chalawan The Likay Musical. Wikimedia Commons has media related to Dance of Thailand.